Featured here are some of Mike Gregory's classic Volkswagen collection.Gregory, a direct decedent of Rob Roy, is a leader and innovator in the classic Volkswagen show world. Gregory generally presents his cars as art projects and enjoys using a heavy dose of funk with his pieces. 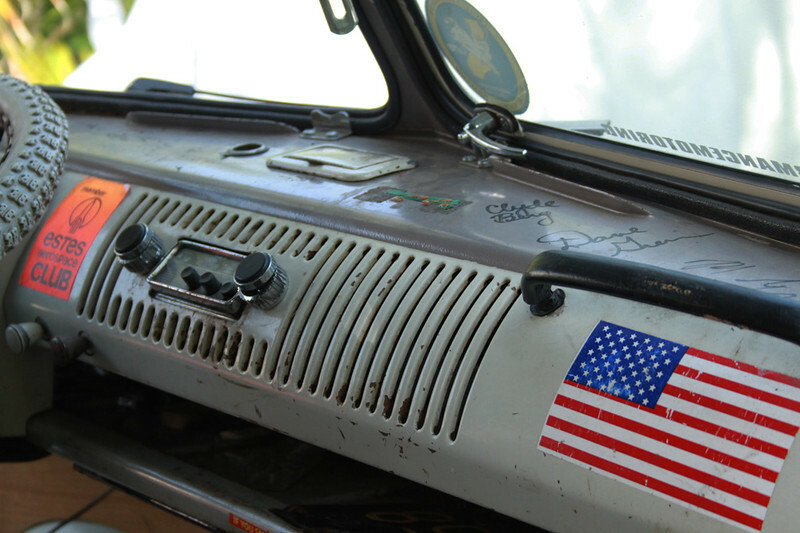 His crew cab, for example, features sanding techniques and clean-up work that accents the ride's history and character and has been signed my many collecting luminaries such as Clyde Berg and Bob Lacoste. Gregory also uses stickers and signs from his rare collections to further enhance his projects. Especially noteworthy in the California artist's work are his thematic presentations. He once did a classic Kombi that represented a traveling carnival clown's living quarters and drunken dunk tank. An old oval window bug was outfitted with trailer full of wonderful and collectable junk that was supposed to be a 1960 dump run. A '67 bug he got from a bricklayer was set up as a work rig. Gregory's current project, a 1960 Karmann Ghia convertible is already taking a distinctive look and will no doubt gather crowds in the coming Southern California car shows.